In December, Gil and his wife and Judy participated in a book signing. 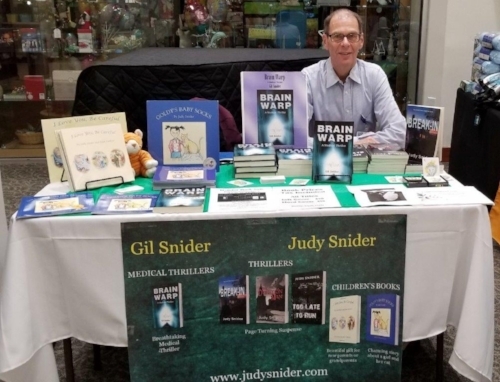 Gil signed copies of Brain Warp and discussed his upcoming thriller The Last with fans, while Judy signed copies of her children’s book as well as her thriller novels, including her latest novel Break In. The musical journey of songwriting couple Judy and Gil Snider started a few years ago when they took a bus tour called “Taste and Sounds of the South” that included tours of Nashville, Memphis, and New Orleans, focusing on music, studios, and great food. During the trip, they discovered American Songwriter magazine, and on the way to tour Graceland they wrote the lyrics to their first song, entering the song in one of the magazine’s periodic lyric-writing contests. Well, they didn’t win, but it was a start! Later, and as fate would have it, the couple had a business meeting at their home, and Billy Rae Stewart and Judy began talking about music. Judy said she and Gil loved writing lyrics but had no idea how to put them to music. Turns out Billy Rae’s father was Redd Stewart, the legendary songwriter who co-wrote the classic country hitTennessee Waltz. Billy agreed to create the music for the Snider’s song, If I Call A Name At Night. After that experience, the Sniders began to write more, ultimately having two more songs recorded at Pearl Snap Studios in Nashville. They are especially proud of their latest song, What More Can I Say, a mother-son wedding song that was written after one of their sons got married, and released as their oldest son got engaged. It is a joint love song for them, and as one listener said, "This song will be out there forever.” The Sniders are marketing the song for weddings/film/TV through TuneCore Publishing. Judy said, “The main thing is our sons love it!” She added, “I joined NSAI a year and a half ago, and Tidewater NSAIhas been so GREAT at reaching out and doing their newsletters! We live in Virginia Beach, work late, and are not fans of going thru the tunnel, so we don't make the meetings, but we are there in spirit! We love to go to other member's websites and listen to their music. We hope National (NSAI) holds a "Beach NSAI" event someday by/near the ocean! Author and physician Dr. Gil Snider Published Brain Warp, a medical/political thriller about a plot to poison West-leaning Ukrainian President, in September, 2003. Of Ukrainian descent, Dr. Snider was aware of Ukrainians' strong feelings of nationalism and long history of wariness toward their powerful Russian neighbor to the East. Although primarily a medical thriller, Dr. Snider stretched the boundaries of the genre to make the political element a focal point of his novel. He included the struggles of a previously Communist society against forces of political and economic corruption as it moved toward free-market capitalism, the ambivalent feelings of highly nationalistic Ukrainians toward Russia and the West, and the development of a powerful criminal organization out of the post-independence chaos. When friends read recent headlines of massive demonstrations protesting the re-election of a pro-Russian Prime Minister and evidence that the opposing candidate had been poisoned prior to the election, they were surprised at the parallels between the book and ongoing political developments. Some laughingly wondered whether he was psychic or had secret political connections. The truth is that as a result of Dr. Snider's research years prior to publishing his book he became aware of the political and historical complexity of the relationship between the two Slavic countries. Not only did this provide an interesting plot line, but served as a jumping off point for Dr. Snider to learn more about his interesting heritage.